Guys, you know how much I love adult historical romance. And I haven't yet found that excitement I get from the romance and the dresses and everything in a YA historical romance before, but Cinders & Sapphires was everything I could have wanted! It was what I wanted the Luxe series to be, but what it wasn't for me! I love that Cinders & Sapphires is set in a time when things are a-changing, there's the movement for women's right to vote and to an education and can I just say how happy I am that things worked out, cause you know I wouldn't be where I am now if it hadn't been for those groundbreakers. I loved experiencing the limitations with the hope of MORE through Ada. The POV switches between several characters, of which I loved Ada and Rose best, though I must say that I have a soft spot for Sebastian as well. Ada is an intelligent young woman who wants to be educated and I love her for that! I loved seeing the bond developing between her and Rose. Of course there is a starcrossed romance and I love every minute of it! There are furtive glances, meetings behind luggage (though I must say my favourite is still the meeting behind the potted plant), LOVE LETTERS! *sigh* You just can't compare a love letter to an e-mail/text... I did think Ada and Ravi fell in love pretty quickly, but they just had that connection, you know? And gah, there better be some working out of things in the next book! I loved the drama and the intrigue and the dresses and the romance... And I loved that Leila Rasheed touches upon more than one controversy and there's a homosexual relationship which is something that was NOT DONE in those times. I did however think that three female characters seemed to be evil without a very good reason for it, there's the classic stepmonster, but I'm willing to overlook this in light of my absolute LOVE of the story! I read this 400 page novel in no time at all, it was such smooth reading! 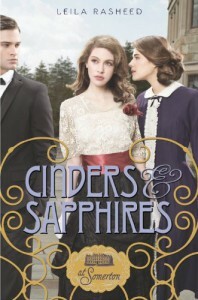 I've heard Cinders & Sapphires be compared to Downton Abbey and all I can is: if it is anything like this book, I need to watch it! This is absolutely my kind of book and I think any historical fiction/romance loving reader will enjoy it!